What awesome item might this be? 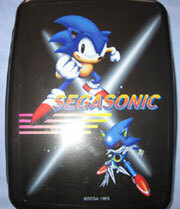 It's Sonic vs. Metal Sonic with a cool logo and design on a slick black box. A SEWING box, that is. Wait, a Sewing Box? This has to be one of the more unique and unsuspecting Sonic items. Here are 2 unknown figures. 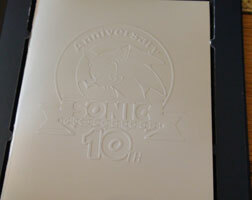 The first, fat one looks like it could be a Sonic stamp of some kind, but it is not from the set on Page 1...it sure is chubby, though. The second figure is cooler, and has an interesting pose. This looks like a PVC or possibly hard plastic figure. Unfortunatly, it has a chip out of the forehead paint, and a scuff on the top...Because there should be a soccer ball there. If you look at the 'dangler' lower on this page, this is the same figure, but broken. This is a metal icon of some kind, found in Tokyo. Obviously done around the Sonic Adventure era (green eyes) it is not that large. It looks like it has a base of some sort, but what is this for? Is it some kind of painted metal sculpture? Here's a nice plastic box. What a curious little item this is. It's another odd "Chibi" sort-of styled Sonic...something. It likely "does" something, although it is difficult to determine exactly what it is for, with just these photos. As you can see, it doesn't sit directly on the ground, meaning there's something underneath it. Could it be some kind of stamp? 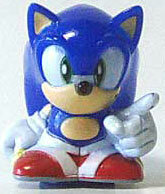 The general legs-less-ness may remind you of an old Sonic keychain, but this is a Sonic Adventure era item. All strange and stubby like this it is rather odd, but could it be charming? 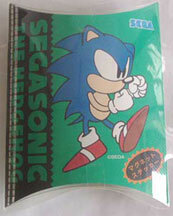 Here are two large stickers, which may of been used to promote Sonic 1. It's the classic stock art stance, but why is one of them red? 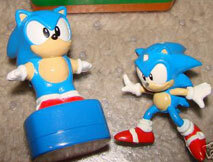 It seems rather strange, as they have swapped the color of his body with the color of his shoes, like a semi-opposite Sonic. Are both of these stickers official? And if so, why the swap? 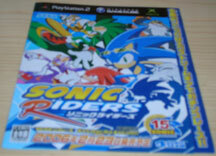 Photo by Nick M.
This is a Sonic Riders promotional leaflet. 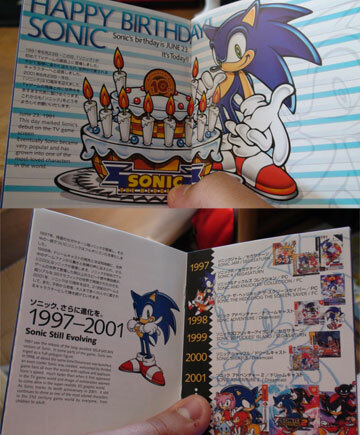 It's sort of like a mini-booklet given away to promote the game, likely in game shops before the game was on sale. You can see the Babylon Rogues, several screenshots and descriptions. What exactly does it say? You can't read it because it's all in Japanese. 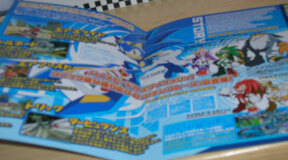 Still, giving away a booklet is a good idea to get information out on an upcoming game. It also makes for an interesting collectible. Photo by: Nick M.